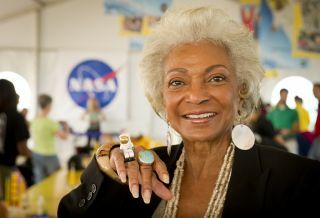 Actress Nichelle Nichols is seen at NASA's Kennedy Space Center in Cape Canaveral, Florida, during a 2010 event with LEGO. While it's not quite beaming up to a spacecraft, a "Star Trek" celebrity plans to take part in a special NASA flight to observe the universe. Nichelle Nichols, best known for playing Lt. Nyota Uhura on "Star Trek: The Original Series," will join the crew of the SOFIA (Stratospheric Infrared Observatory) aircraft on Sept. 17, the star announced July 31. "I would love to share this event with my fans through live sharing here on StarPower, a special for my VIP fans supporting the great causes that help make these kinds of historical events happen," Nichols added. "I'm working with NASA to see what's possible." SOFIA, a modified Boeing 747 aircraft, hosts a 100-inch telescope that is used to look at the universe for a few hours at a time during flight, complementing orbital telescopes such as the Hubble Space Telescope and the Spitzer space telescope. SOFIA has a better view of the stars' infrared radiation than ground-based telescopes because it flies above most of Earth's atmospheric water vapor, avoiding its blocking effect. Nichols, 82, has been an active advocate for NASA. In the 1970s and 1980s she served as an astronaut recruit for the agency, bringing in women and minorities such as Guion Bluford, the first African-American in space, NASA officials have said. Nichols has also been active interacting with fans at comic conventions. The Star Trek actress Nichelle Nichols was employed by NASA to recruit new astronauts into the late 1980s. Earlier this year, Nichols had a mild stroke; at the time, officials said more evaluations would be needed to predict how well she would recover. On "Star Trek," Nichols played a vital communications officer, and she is also widely cited as being among the first to share an on-screen interracial kiss on television. The other person participating was William Shatner, who played Captain James T. Kirk. Before Nichols took the role of Uhura, most African-Americans were relegated to secondary roles on television, such as servants, NASA has said in previous statements.